If there is one general rule in dentistry, it’s that healthy teeth don’t hurt. (And if there are two, it’s that flossing is key!) Back to the first — are you experiencing a toothache? 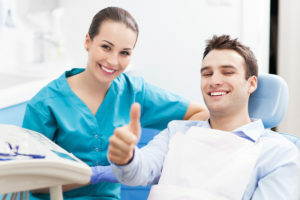 If so, you should schedule an appointment with your emergency dentist in Carrollton right away. Doing so will help to keep that minor/moderate ache from becoming a more significant issue. But just like in all things, there is no one-size-fits-all type of tooth pain. Keep reading to find out about the most common types of dental discomfort, and which one may be to blame for your oral problem. A toothache is just your mouth’s way of telling you that something is wrong — so listen up! Take notice of the particular symptoms to get a better idea of what is causing your tooth pain. A sharp pang in response to pressure: Could indicate infection or dental damage, like a broken or cracked tooth. A dull toothache: This type of tooth pain usually indicates an infected tooth that requires a root canal or a dental crown. Sensitivity to heat and cold: This could be caused by worn tooth enamel due to aggressive toothbrushing or other factors. Your dentist may be able to help with a fortifying fluoride treatment. Pain at the back of the jaw: This is a particular type of pain that may indicate the presence of impacted wisdom teeth or issues with the TMJ (temporomandibular joint). For wisdom teeth, prompt extraction may be recommended. Before you can make it to your dentist’s office for treatment for tooth pain, you may need to take some steps to manage the pain on your own. Feel free to use an over-the-counter pain reliever as recommended to reduce discomfort. Remember to drink plenty of water and avoid alcohol while you are taking pain medication. Rinsing your mouth with warm salt water can also have a soothing effect and help to kill bacteria. Dissolve a few tablespoons of salt into boiling water, let cool, and swish around your mouth for one to two minutes. Repeat as needed throughout the day. An ice pack may also help to reduce swelling associated with an infected or injured tooth. Wrap a bag of ice or frozen peas in a protective covering and place on the affected cheek in 10- to 15-minute intervals. Repeat every few hours for continued relief. Whatever you do to help alleviate your dental pain, don’t forget that these are only temporary solutions. Seeing your dentist ASAP is crucial for preventing the side effects of untreated tooth pain — so don’t delay! The Celebration Family Dental team offers comprehensive dental care from the comfort of their state-of-the-art practice. If you have a toothache, we can help! To learn more or to schedule an appointment with experts in dental emergencies, contact your dentist in Carrollton at 469-892-6647.